It's that time of year again when I celebrate my fatherland. 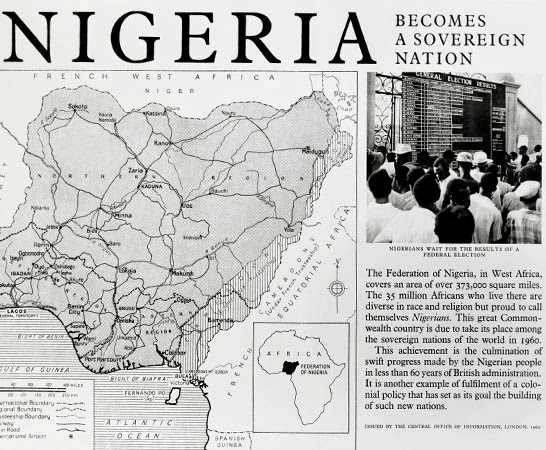 Today Nigeria turns 54. Happy Independence!!!! And for the third year in a row I am using the month of October to celebrate the literature from the country I was birthed and raised*.
" ... Nigeria is a mesmerising place for a ny writer to write about, and the country boasts some of the greatest authors in African literature. The person from an African country to win the Nobel Prize for Literature was Nigerian playwright and poet Wole Soyinka in 1986. Nigerian Chinua Achebe's Things Fall Apart, published in 1958, is still one of the most widely read book in African literature. The first African author to win the Orange Prize for Fiction was Chimamanda Ngozi Adichie with her novel Half of a Yellow Sun in 2007, and the the first Booker Prize awarded to an African author went to Nigerian Ben Okri's The Famished Road in 1991. Evidently, Nigeria has a rich literary tradition, which continues to this day." In addition to producing some prolific and internationally acclaimed writers, we also have a thriving literary scene with younger generation of writers, as well as publishing houses, literary magazines and literary festivals that are helping to shape it. So like previous years, I bring to you my way of saying Happy Independence to Nigeria. Hope you enjoy!!! *Previous celebrations can be found here and here.